Colorado allows you to complete your divorce without an attorney if you and your spouse can come to an agreement on what to do with your property and how you will care for any children that you have. One of the spouses must have lived in Colorado for 90 days before a divorce can be filed here. An irretrievable breakdown of the marriage is the only grounds for divorce in Colorado. Both spouses sign the Petition for Dissolution of Marriage, and then one spouse files it with the Clerk of Courts. The Court will send you a Case Management Order or similiar document, after which time both spouses sign the Decree of Dissolution (and supporting documents), and one spouse files them with the Court. Wait ninety (90) days to receive your Decree of Dissolution signed by the Judge. 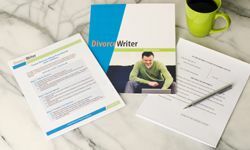 DivorceWriter provides forms specific to the state of Colorado and offers a money back guarantee if your documents are not accepted by the Court. Colorado couples with children are required to attend a parenting class as well as a brief final hearing. You have qualified to use DivorceWriter to complete your Colorado divorce papers online. Select "Continue" to start the interview.